The Torrent jacket, built to battle everything nature has to throw at it. Insulated with exclusive Softie® insulation and taped seams making it fully waterproof. This fully featured jacket is equipped with a detachable insulated hood that can be rolled away or removed when not in use, dual adjusters on the sides and rear of the hood allow for a perfect fit. Deep hand pockets allow you to store your gloves or valuables safely and thermal linings also help to keep your hands warm and comfortable. You will also find a deep hidden chest pocket inside the jacket. 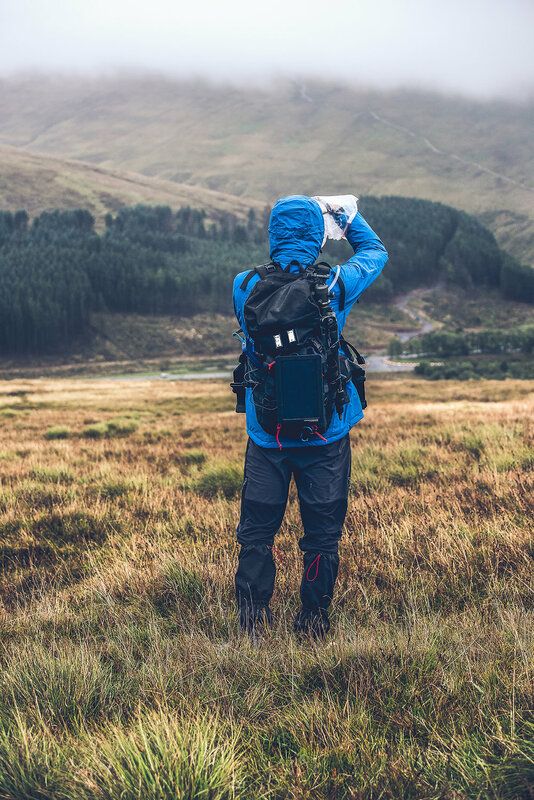 I first got my hands on the Snugpak Torrent Jacket back in September just before returning to the Brecon Beacons with Owen Vachell to take him around the area and introduce him to wild camping and this area of Wales. Of course, like most trips even the best laid plans can become a wash out and this was much the same on this weekend visit. Forecasted to be dry at the beginning of the week, a storm quickly blew through and the weekend was now forecasted to just be wet and misty. Not a problem for myself but as an introduction to wild camping, mountaineering and at this time of the year Owen had a bad weekend to introduce him which was a huge shame, but it hasn’t put him off. Survive this and anything else is a bonus, safe to say we both walked away with some nice photos and a good weekend despite the weather but I for one am very glad I had the Torrent jacket. Although a little warm still for the time of year the Torrent jacket was only needed with one layer below which goes to show you how insulated the jacket is. With Snugpak rating it down to -5ºc comfort and -10ºc extremes, matching that of the ML6 smock I reviewed earlier in the year but speaking from experience with the “Beast from the East” the ML6 can keep you extremely comfortable with the Impact fleece and smock combined where we saw temperatures drop to -20ºc in areas with the heavy snow and winds. So I for one can foresee the Torrent jacket matched with the Impact fleece or even SJ3-6 to be an outstanding jacket for winter conditions, especially as it’s fully waterproof. Rated at PU 10,000mm. On the mountain and hill tops around Pen Y Fan the jacket provided excellent protection, keeping me warm from the wind which was more a concern, only at lower levels in the valleys and waterfalls was the rain a concern where the wind levels died right down but in both situations the jacket provided excellent protection from the elements. However, in these lower valleys where wind levels dropped, and we were walking through woodland the jacket was a touch on the warmer side of comfort. Opening the jackets front and underarm ventilation zips helped to maintain heat levels which the underarm zips are very easy to use one handed and doesn’t require you to remove the jacket in order to zip back up or down. The jacket features a large detachable hood which can be removed when not needed which is a simple zip along the back and two velcro tabs on the front which tuck in to provide protection and create a chin guard which also has added polyester material to keep your neck warm. The hood is fully adjustable on the back, so you can use with a woolly hat or helmet if required and across the body adjustable hems on the wrists and waist to provide further adjustments if required. The Torrent jacket is packed with plenty of deep pockets which can all fit an OS map inside, phone or even a small camera. The two main pockets are fleece lined for added warmth when needed and the larger hidden inside pocket just by the main zipper to the left is great for papers and as mentioned before an OS map or for you photographers storing filters or lens caps when not needed and although by the main jacket zipper and on the outside remains protected from the cold and wet of the exterior. The jacket is a little on the heavier side and a difficult to compact down compared to its counterparts of the ML6 Smock or SJ range from Snugpak so if you wish to take it away for camping a large pack of 50-60L plus and at nearly a 1kg its the heaviest of the three but in comparison is the most robust and durable of the three. 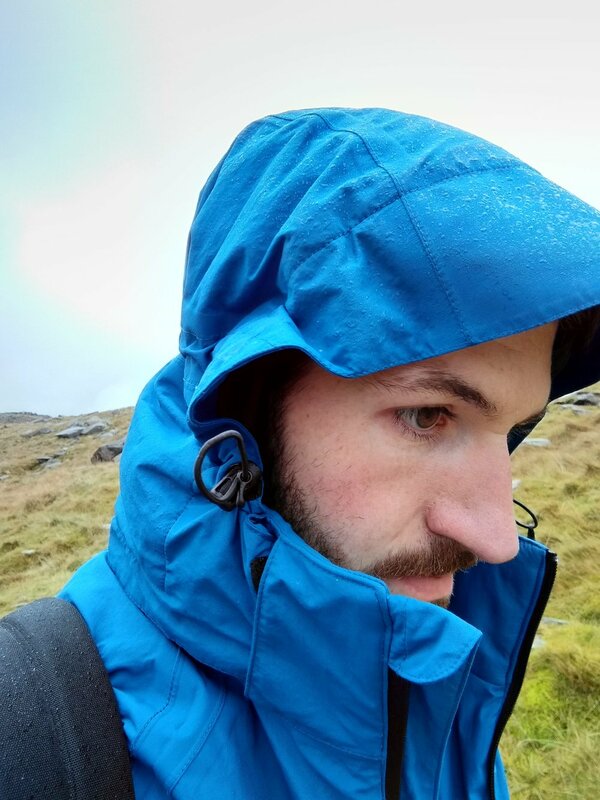 The ML6 is one of my favourites of the Snugpak range and I already know it’s incredibly well made and durable in extreme conditions, but I do feel the Torrent jacket with its waterproof and stronger exterior will be a better suited jacket for Winter conditions. Packing the two will certainly have you covered for all extremes the UK weather has to throw at you. Following my week in North Wales which had first been forecasted as Wintery with heavy snow showers on the peaks and light dusting around 400m, but this couldn’t had been further off if the weather tried! Instead the week was very wet with strong gales at 60mph and plenty of rain but remaining very warm for the time of the year at 13ºc. With this new forecast I was disappointed as I was looking forward to some snow and digging out my much loved ML6 Smock, but I have to say I am ever grateful for having the Torrent Jacket. In these Autumn conditions and somewhat stormy conditions, the jacket was ideal and perfect! I only used this jacket during the week up in North Wales with the fleeces when it got colder. The jacket was the perfect piece of kit needed and suited the higher levels of Pen Yr Ole Wen, Snowdon and Dinorwic or the lower valley levels. With the temperatures being fairly high for this time of the year I noticed the warmth of the jacket a little more. Only on Snowdon and the early start on Dinorwic did I need to wear a fleece underneath the jacket but for the most the jacket alone was all that was needed in the week. Using the under-arm ventilation was always a huge help to keep temperatures down and avoid sweating, especially with the amount of rain fall which prevented me from opening the jacket. In the windy conditions the jacket really took the chill of the wind out, even when I wasn’t moving on the mountain side in the wind. The hood when pulled tight was very snug and you can feel the whole hood wrap tight around your ears which was like wearing a pair of ear muffs the only issue was when someone tried speaking to you in the wind and the hood on you had to take two and ask for the odd sentence to be repeated but I’m sure this was more down to the high winds over the jacket. The cords to tighten the hood are very easy to use and can be pulled with one hand but for ease two hands is of course better. Even in the extremes on Clee Hill where I could stand at a 45º angle I was still very warm on the hill side so this jacket will certainly stand the tests of Winter. The pockets I found were plenty big and the most useful for me during the week was the interior pocket on the chest. It’s surprisingly big and can comfortable fit an OS map, mobile phone/GPS and extras inside. Although on the front of the jacket the pockets contents stay dry so there were no concerns here as I tested by leaving my lens cloths and phone in this pocket throughout the week and never had an issue with either getting wet. The exterior of the jacket is also very tough and a great layer to help protect you when climbing through the undergrowth or climbing around quarries and mountains. I wasn’t precious with the jacket and happily leaning on wire, slate, rocks and trees and climbing in and out of holes for vantage points for photos and the jacket did get dirty but never tore and was very easy to clean down in the rain. When finished for the day and returning back to the cottage it was a case of drying the kit out ready for the next outing. The jacket was very fast drying and would dry off in an hour and not placed near a heat source but left on the back of a door. I have really enjoyed using the Torrent Jacket. It’s tough, keeps you very dry and is incredibly warm making it great for Autumn in to Winter and can foresee it being very useful in the Winter months. However, I have found it a little too warm at times and this is where I believe Snugpak need to expand the Torrent and create a wider range much like the SJ or ML ranges, so you can have 100% water/wind proof protection throughout the year. The Torrent jackets price point of £160 and unisex design makes it an affordable option for experts and those new to the outdoors and even in the colder months the jacket has plenty of space inside to wear a fleece or another jacket which is certainly helpful if you feel the cold. The jacket is on the heavier side compared to down jackets such as the ML6 or even the SJ6 jackets which are better suited for those in the mountains for camping and hiking long distances on expeditions but it’s not silly heavy just you can’t compact it down as much in comparison which the SJ6 has a convenient pouch to compress in the rucksack. If you plan on taking this jacket on longer distances expert to be using a larger pack such as a 60L+ bag to accommodate the jackets size. Don’t let this put you off however as it’s easy to store the jacket, just don’t expect it to be the same as a down jacket as it’s a whole lot better in protection from the elements. The Torrent Jacket gives you 100% protection no matter where you are whether on the coast, mountain top, valley or woodland. Winter update 2019 - Snugpak Torrent Jacket in the Snow and subzero temperatures. Winter finally arrived in late January across the UK, temperatures dropped below freezing with the snow and ice finally here. Personally, I’ve been counting down the days to these conditions, hoping for another Beast from the East like in 2018. This would also be the first opportunity for me to take the Snugpak Torrent Jacket in to conditions below 5ºc and see how this Winter jacket really fairs. Up until now it’s only been rain or a slight chill but nothing difficult and you could use just the Snugpak Torrent jacket on its own with no fleece for comfort and warmth and from previous testing I knew how waterproof and tough the jacket was. The first opportunity I had getting out in the snow was mid-week where my local area around Reading and Marlow saw a surprise snow shower, leaving a couple of centimetres across paths and fields. Coupled with the Snugpak Impact Fleece the snow and -2ºc chill was no concern at all walking to work and having a quick walk around the countryside and river Thames around Marlow. That’s nothing challenging however, cold but it would be the final weekend of January where the real test would reveal how warm the Torrent Jacket was. With snow on the horizon and weather warnings out for heavy snow, myself and the usual gang prepared for a Winter Wild camp in South Snowdonia. However, it wasn’t the freak snow showers we thought but instead a spike in the weather caused it to warm up and brought more rain, 4ºc temperatures and up to 90mph gusts on summits and 50mph on lower levels. Again, coupled with the Snugpak Impact Fleece, the Torrent Jacket and fleece were the perfect combination for this incredibly windy and cold weekend. With a hike up to Llyn Cau, below Cadair Idris we saw the full force of the wind and the first proper sign of snow. 90mph winds which took you out and left you clinging to rocks and shelter. It was dangerous and not a good idea but at no point was I cold. The Torrent Jacket hood provides extra warmth and protection around the neck and face so wind chill and snow couldn’t get in to your face or leave a chill running down your neck, similar at the waist you can adjust the cinch points, creating a sealed off jacket. Much of the weekend I kept a beanie hat on for extra warmth but at this point I used both the beanie and hood. My beanie has a bobble on which did push the top of the Torrent Jacket hood up slightly but didn’t cause any issues with the hood or providing protection. I just looked a little odd with the hood sticking up slightly. The Snugpak Torrent jacket was the perfect jacket needed up here and provided superb protection from the winds. In dire conditions like this, between the Snugpak Torrent Jacket or my favourite Snugpak ML6 smock, I would pick the Torrent Jacket every time. The major benefit I found with the Snugpak Torrent Jacket was the hood with various adjustment points, these helped the hood stay in place and form a warm cushion around my head, the peak of the hood is helpful for protecting my face from snow or rain fall and helped cover my eyes, and as a whole making my face protected and head very toasty. The other obvious benefit is the fact its waterproof. I look forward to more wintery conditions and snow to arrive. Transparency Notice: Please note that I am a Snugpak brand ambassador and receive the products for free to review from Snugpak. The review is no guarantee of endorsement. I receive no monetary gain from Snugpak from the reviews.